Gout is due to elevated levels of uric acid in the blood. This occurs due to a combination of diet and genetic factors. At high levels, uric acid crystallizes and the crystals deposit in joints, tendons and surrounding tissues, resulting in an attack of gout. Gout occurs more commonly in those who eat a lot of meat, drink a lot of beer, or are overweight. Diagnosis of gout may be confirmed by seeing the crystals in joint fluid or tophus. Blood uric acid levels may be normal during an attack. Treatment with nonsteroidal anti-inflammatory drugs (NSAIDs), steroids, or colchicine improves symptoms. Once the acute attack subsides, levels of uric acid can be lowered via lifestyle changes and in those with frequent attacks, allopurinol or probenecid provides long-term prevention. Taking vitamin C and eating a diet high in low fat dairy products may be preventive. Gout affects about 1 to 2% of the Western population at some point in their lives. It has become more common in recent decades. This is believed to be due to increasing risk factors in the population, such as metabolic syndrome, longer life expectancy and changes in diet. Older males are most commonly affected. Gout was historically known as "the disease of kings" or "rich man's disease". It has been recognized at least since the time of the ancient Egyptians. Gout can present in multiple ways, although the most usual is a recurrent attack of acute inflammatory arthritis (a red, tender, hot, swollen joint). The metatarsal-phalangeal joint at the base of the big toe is affected most often, accounting for half of cases. Other joints, such as the heels, knees, wrists and fingers, may also be affected. Joint pain usually begins over 2–4 hours and during the night. This is mainly due to lower body temperature. Other symptoms may rarely occur along with the joint pain, including fatigue and a high fever. Studies in the early 2000s found that other dietary factors are not relevant. Specifically, moderate consumption of purine-rich vegetables (e.g. beans, peas, lentils and spinach) are not associated with gout. Neither is total consumption of protein. Alcohol consumption is strongly associated with an increased risk, with wine presenting somewhat less of a risk than beer and spirits. The consumption of coffee, vitamin C and dairy products, as well as physical fitness, appear to decrease the risk. This is believed to be partly due to their effect in reducing insulin resistance. Gout is partly genetic, contributing to about 60% of variability in uric acid level. The SLC2A9, SLC22A12 and ABCG2 genes have been found to be commonly associated with gout and variations in them can approximately double the risk. Loss-of-function mutations in SLC2A9 and SLC22A12 cause hereditary hypouricaemia by reducing urate absorption and unopposed urate secretion. The rare genetic disorders familial juvenile hyperuricemic nephropathy, medullary cystic kidney disease, phosphoribosylpyrophosphate synthetase superactivity and hypoxanthine-guanine phosphoribosyltransferase deficiency as seen in Lesch-Nyhan syndrome, are complicated by gout. Gout frequently occurs in combination with other medical problems. Metabolic syndrome, a combination of abdominal obesity, hypertension, insulin resistance and abnormal lipid levels, occurs in nearly 75% of cases. Other conditions commonly complicated by gout include polycythemia, lead poisoning, kidney failure, hemolytic anemia, psoriasis and solid organ transplants. A body mass index greater than or equal to 35 increases male risk of gout threefold. Chronic lead exposure and lead-contaminated alcohol are risk factors for gout due to the harmful effect of lead on kidney function. Lesch-Nyhan syndrome is often associated with gouty arthritis. Diuretics have been associated with attacks of gout. However, a low dose of hydrochlorothiazide does not seem to increase risk. Other medications that increase the risk include niacin, aspirin (acetylsalicylic acid), ACE inhibitors, angiotensin receptor blockers (except losartan), beta blockers, ritonavir, and pyrazinamide. The immunosuppressive drugs ciclosporin and tacrolimus are also associated with gout, the former more so when used in combination with hydrochlorothiazide. Gout is a disorder of purine metabolism, and occurs when its final metabolite, uric acid, crystallizes in the form of monosodium urate, precipitating and forming deposits (tophi) in joints, on tendons and in the surrounding tissues. Microscopic tophi may be walled off by a ring of proteins, which blocks interaction of the crystals with cells and therefore avoids inflammation. Naked crystals may break out of walled-off tophi due to minor physical damage to the joint, medical or surgical stress, or rapid changes in uric acid levels. When they break through the tophi, they trigger a local immune-mediated inflammatory reaction in macrophages, which is initiated by the NLRP3 inflammasome protein complex. Activation of the NLRP3 inflammasome recruits the enzyme caspase 1, which converts pro-interleukin 1β into active interleukin 1β, one of the key proteins in the inflammatory cascade. An evolutionary loss of urate oxidase (uricase), which breaks down uric acid, in humans and higher primates has made this condition common. The triggers for precipitation of uric acid are not well understood. While it may crystallize at normal levels, it is more likely to do so as levels increase. Other triggers believed to be important in acute episodes of arthritis include cool temperatures, rapid changes in uric acid levels, acidosis, articular hydration and extracellular matrix proteins, such as proteoglycans, collagens and chondroitin sulfate. The increased precipitation at low temperatures partly explains why the joints in the feet are most commonly affected. Rapid changes in uric acid may occur due to factors including trauma, surgery, chemotherapy, diuretics and stopping or starting allopurinol. Calcium channel blockers and losartan are associated with a lower risk of gout compared to other medications for hypertension. Gout may be diagnosed and treated without further investigations in someone with hyperuricemia and the classic acute arthritis of the base of the great toe (known as podagra). Synovial fluid analysis should be done, however, if the diagnosis is in doubt. 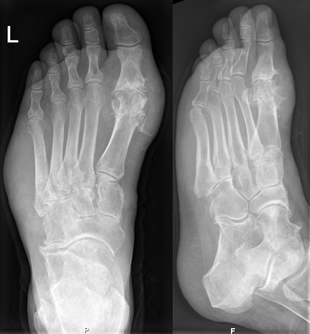 X-rays, while useful for identifying chronic gout, have little utility in acute attacks. Hyperuricemia is a classic feature of gout, but it occurs nearly half of the time without hyperuricemia and most people with raised uric acid levels never develop gout. Thus, the diagnostic utility of measuring uric acid levels is limited. Hyperuricemia is defined as a plasma urate level greater than 420 μmol/l (7.0 mg/dl) in males and 360 μmol/l (6.0 mg/dl) in females. Other blood tests commonly performed are white blood cell count, electrolytes, kidney function and erythrocyte sedimentation rate (ESR). However, both the white blood cells and ESR may be elevated due to gout in the absence of infection. A white blood cell count as high as 40.0×109/l (40,000/mm3) has been documented. The initial aim of treatment is to settle the symptoms of an acute attack. Repeated attacks can be prevented by medications that reduce serum uric acid levels. Tentative evidence supports the application of ice for 20 to 30 minutes several times a day to decrease pain. Options for acute treatment include nonsteroidal anti-inflammatory drugs (NSAIDs), colchicine and steroids, while options for prevention include allopurinol, febuxostat, and probenecid. Lowering uric acid levels can cure the disease. Treatment of associated health problems is also important. Lifestyle interventions have been poorly studied. It is unclear whether dietary supplements have an effect in people with gout. NSAIDs are the usual first-line treatment for gout. No specific agent is significantly more or less effective than any other. Improvement may be seen within four hours and treatment is recommended for one to two weeks. They are not recommended, however, in those with certain other health problems, such as gastrointestinal bleeding, kidney failure, or heart failure. While indometacin has historically been the most commonly used NSAID, an alternative, such as ibuprofen, may be preferred due to its better side effect profile in the absence of superior effectiveness. For those at risk of gastric side effects from NSAIDs, an additional proton pump inhibitor may be given. There is some evidence that COX-2 inhibitors may work as well as nonselective NSAIDs for acute gout attack with fewer side effects. Pegloticase was approved in the USA to treat gout in 2010. It is an option for the 3% of people who are intolerant to other medications. Pegloticase is administered as an intravenous infusion every two weeks, and reduces uric acid levels. It is likely useful for tophi but has a high rate of side effects. A number of medications are useful for preventing further episodes of gout, including xanthine oxidase inhibitors (including allopurinol and febuxostat) and uricosurics (including probenecid and sulfinpyrazone). They are not usually started until one to two weeks after an acute flare has resolved, due to theoretical concerns of worsening the attack. They are often used in combination with either an NSAID or colchicine for the first three to six months. They are not recommended until a person has had two attacks of gout, unless destructive joint changes, tophi, or urate nephropathy exist, because the medications have not been found to be cost-effective. Urate-lowering measures should be increased until serum uric acid levels are below 300–360 µmol/l (5.0–6.0 mg/dl) and continue indefinitely. If these medications are in chronic use at the time of an attack, discontinuation is recommended. Levels that cannot be brought below 6.0 mg/dl while attacks continue indicates treatment failure or refractory gout. Overall, probenecid appears to be less effective than allopurinol. Uricosuric medications are typically preferred if undersecretion of uric acid, as indicated by a 24-hour collection of urine results in a uric acid amount of less than 800 mg, is found. They are, however, not recommended if a person has a history of kidney stones. A 24-hour urine excretion of more than 800 mg, which indicates overproduction, is an indication for a xanthine oxidase inhibitor. Xanthine oxidase inhibitors block uric acid production. Long-term therapy is safe and well tolerated and can be used in people with decreased kidney function or urate stones, although allopurinol has caused hypersensitivity in a small number of individuals. In such cases febuxostat is recommended. Without treatment, an acute attack of gout usually resolves in five to seven days; however, 60% of people have a second attack within one year. Those with gout are at increased risk of hypertension, diabetes mellitus, metabolic syndrome and kidney and cardiovascular disease and thus are at increased risk of death. This may be partly due to its association with insulin resistance and obesity, but some of the increased risk appears to be independent. Without treatment, episodes of acute gout may develop into chronic gout with destruction of joint surfaces, joint deformity and painless tophi. These tophi occur in 30% of those who are untreated for five years, often in the helix of the ear, over the olecranon processes, or on the Achilles tendons. With aggressive treatment, they may dissolve. Kidney stones also frequently complicate gout, affecting between 10 and 40% of people and occur due to low urine pH promoting the precipitation of uric acid. Other forms of chronic kidney dysfunction may occur. Gout affects around 1–2% of the Western population at some point in their lifetimes and is becoming more common. Some 5.8 million people were affected in 2013. Rates of gout approximately doubled between 1990 and 2010. This rise is believed to be due to increasing life expectancy, changes in diet and an increase in diseases associated with gout, such as metabolic syndrome and high blood pressure. Factors that influence rates of gout, include age, race and the season of the year. In men over 30 and women over 50, rates are 2%. In the United States, gout is twice as likely in males of African descent than those of European descent. Rates are high among Pacific Islanders and the Māori, but rare in aboriginal Australians, despite a higher mean uric acid serum concentration in the latter group. It has become common in China, Polynesia and urban sub-Saharan Africa. Some studies found that attacks of gout occur more frequently in the spring. This has been attributed to seasonal changes in diet, alcohol consumption, physical activity and temperature. Gouty patients are, generally, either old men or men who have so worn themselves out in youth as to have brought on a premature old age—of such dissolute habits none being more common than the premature and excessive indulgence in venery and the like exhausting passions. The victim goes to bed and sleeps in good health. About two o'clock in the morning he is awakened by a severe pain in the great toe; more rarely in the heel, ankle or instep. The pain is like that of a dislocation and yet parts feel as if cold water were poured over them. Then follows chills and shivers and a little fever... The night is passed in torture, sleeplessness, turning the part affected and perpetual change of posture; the tossing about of body being as incessant as the pain of the tortured joint and being worse as the fit comes on. Gout is rare in most other animals due to their ability to produce uricase, which breaks down uric acid. Humans and other great apes do not have this ability, thus gout is common. Other animals with uricase include fish, amphibians and most non primate mammals. The Tyrannosaurus rex specimen known as "Sue", however, is believed to have suffered from gout. A number of new medications are under study for treating gout, including anakinra, canakinumab and rilonacept. Canakinumab may result in better outcomes than a low dose of a steroid but costs five thousand times more. A recombinant uricase enzyme (rasburicase) is available; its use, however, is limited, as it triggers an immune response. Less antigenic versions are in development. ↑ Brookhiser, Richard (2008). Gentleman Revolutionary: Gouverneur Morris, the Rake Who Wrote the Constitution. Simon and Schuster. p. 212. ISBN 9781439104088. ↑ Haslam, Fiona (1996). From Hogarth to Rowlandson : medicine in art in eighteenth-century Britain (1. publ. ed.). Liverpool: Liverpool University Press. p. 143. ISBN 9780853236405. 1 2 3 4 5 6 7 8 9 10 11 12 13 14 15 16 17 18 Chen LX, Schumacher HR (October 2008). "Gout: an evidence-based review". J Clin Rheumatol. 14 (5 Suppl): S55–62. doi:10.1097/RHU.0b013e3181896921. PMID 18830092. ↑ Stein, John J. Cush, Arthur Kavanaugh, C. Michael (2005). Rheumatology : diagnosis and therapeutics (2nd ed.). Philadelphia: Lippincott, Williams & Wilkins. p. 192. ISBN 9780781757324. 1 2 3 4 5 6 7 8 9 10 11 12 13 14 15 16 17 18 19 20 21 22 23 24 25 26 27 28 29 30 31 32 33 34 35 36 Richette P, Bardin T (January 2010). "Gout". Lancet. 375 (9711): 318–28. doi:10.1016/S0140-6736(09)60883-7. PMID 19692116. 1 2 3 4 5 6 7 8 9 10 11 12 13 14 Schlesinger N (March 2010). "Diagnosing and treating gout: a review to aid primary care physicians". Postgrad Med. 122 (2): 157–61. doi:10.3810/pgm.2010.03.2133. PMID 20203467. 1 2 "Rich Man's Disease – definition of Rich Man's Disease in the Medical dictionary". Free Online Medical Dictionary, Thesaurus and Encyclopedia. 1 2 3 4 5 6 7 8 9 Eggebeen AT (2007). "Gout: an update". Am Fam Physician. 76 (6): 801–8. PMID 17910294. 1 2 3 4 5 6 7 Terkeltaub R (January 2010). "Update on gout: new therapeutic strategies and options". Nature Reviews Rheumatology. 6 (1): 30–8. doi:10.1038/nrrheum.2009.236. PMID 20046204. 1 2 Tausche AK, Jansen TL, Schröder HE, Bornstein SR, Aringer M, Müller-Ladner U (August 2009). "Gout—current diagnosis and treatment". Dtsch Arztebl Int. 106 (34–35): 549–55. doi:10.3238/arztebl.2009.0549. PMC 2754667 . PMID 19795010. ↑ Vitart V, Rudan I, Hayward C, et al. (April 2008). "SLC2A9 is a newly identified urate transporter influencing serum urate concentration, urate excretion and gout". Nat. Genet. 40 (4): 437–42. doi:10.1038/ng.106. PMID 18327257. 1 2 3 4 Weaver, AL (July 2008). "Epidemiology of gout". Cleveland Clinic journal of medicine. 75 Suppl 5: S9–12. doi:10.3949/ccjm.75.Suppl_5.S9. PMID 18819329. 1 2 Choi HK, Atkinson K, Karlson EW, Willett W, Curhan G (March 2004). "Purine-rich foods, dairy and protein intake, and the risk of gout in men". N. Engl. J. Med. 350 (11): 1093–103. doi:10.1056/NEJMoa035700. PMID 15014182. 1 2 3 Singh, JA; Reddy, SG; Kundukulam, J (March 2011). "Risk factors for gout and prevention: a systematic review of the literature.". Current opinion in rheumatology. 23 (2): 192–202. doi:10.1097/BOR.0b013e3283438e13. PMID 21285714. ↑ Roddy, Edward (Oct 1, 2013). "Gout". BMJ. 347: f5648. doi:10.1136/bmj.f5648. ↑ Hak AE, Choi HK (March 2008). "Lifestyle and gout". Curr Opin Rheumatol. 20 (2): 179–86. doi:10.1097/BOR.0b013e3282f524a2. PMID 18349748. ↑ Williams PT (May 2008). "Effects of diet, physical activity and performance, and body weight on incident gout in ostensibly healthy, vigorously active men". Am. J. Clin. Nutr. 87 (5): 1480–7. PMID 18469274. 1 2 Choi HK (March 2010). "A prescription for lifestyle change in patients with hyperuricemia and gout". Curr Opin Rheumatol. 22 (2): 165–72. doi:10.1097/BOR.0b013e328335ef38. PMID 20035225. ↑ Park, Kyu Yong; Kim, Hyun Jung; Ahn, Hyeong Sik; Kim, Sun Hee; Park, Eun Ji; Yim, Shin-Young; Jun, Jae-Bum (April 2016). "Effects of coffee consumption on serum uric acid: systematic review and meta-analysis". Seminars in Arthritis and Rheumatism. 45 (5): 580–586. doi:10.1016/j.semarthrit.2016.01.003. ↑ Merriman, TR; Dalbeth, N (2011). "The genetic basis of hyperuricaemia and gout.". Joint, bone, spine : revue du rhumatisme. 78 (1): 35–40. doi:10.1016/j.jbspin.2010.02.027. PMID 20472486. 1 2 Reginato AM, Mount DB, Yang I, Choi HK (2012). "The genetics of hyperuricaemia and gout". Nature Reviews Rheumatology. 8 (10): 610–21. doi:10.1038/nrrheum.2012.144. PMC 3645862 . PMID 22945592. ↑ Stamp L, Searle M, O'Donnell J, Chapman P (2005). "Gout in solid organ transplantation: a challenging clinical problem". Drugs. 65 (18): 2593–611. doi:10.2165/00003495-200565180-00004. PMID 16392875. ↑ Loghman-Adham M (September 1997). "Renal effects of environmental and occupational lead exposure". Environ. Health Perspect. Brogan & Partners. 105 (9): 928–38. doi:10.2307/3433873. JSTOR 3433873. PMC 1470371 . PMID 9300927. 1 2 3 Laubscher T, Dumont Z, Regier L, Jensen B (December 2009). "Taking the stress out of managing gout". Can Fam Physician. 55 (12): 1209–12. PMC 2793228 . PMID 20008601. 1 2 3 4 Dalbeth, N; Merriman, TR; Stamp, LK (April 2016). "Gout". Lancet (Review). S0140-6736 (16): 00346-9. doi:10.1016/S0140-6736(16)00346-9. PMID 27112094. ↑ Firestein, MD, Gary S.; Budd, MD, Ralph C.; Harris Jr., MD, Edward D.; McInnes PhD, FRCP, Iain B.; Ruddy, MD, Shaun; Sergent, MD, John S., eds. (2008). "Chapter 87: Gout and Hyperuricemia". Kelley's Textbook of Rheumatology (8th ed.). Elsevier. ISBN 978-1-4160-4842-8. 1 2 3 Liu-Bryan, Ru; Terkeltaub, Robert (2006). "Evil humors take their Toll as innate immunity makes gouty joints TREM-ble". Arthritis & Rheumatism. 54 (2): 383–386. doi:10.1002/art.21634. ↑ Virsaladze DK, Tetradze LO, Dzhavashvili LV, Esaliia NG, Tananashvili DE (2007). "[Levels of uric acid in serum in patients with metabolic syndrome]" [Levels of uric acid in serum in patients with metabolic syndrome]. Georgian Med News (in Russian) (146): 35–7. 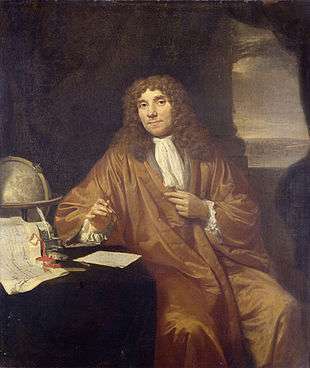 PMID 17595458. ↑ Moyer RA, John DS (2003). "Acute gout precipitated by total parenteral nutrition". The Journal of rheumatology. 30 (4): 849–50. PMID 12672211. ↑ Choi HK, Soriano LC, Zhang Y, Rodríguez LA (2012). "Antihypertensive drugs and risk of incident gout among patients with hypertension: population based case-control study". BMJ. 344: d8190. doi:10.1136/bmj.d8190. PMC 3257215 . PMID 22240117. ↑ Sturrock R (2000). "Gout. Easy to misdiagnose". BMJ. 320 (7228): 132–33. doi:10.1136/bmj.320.7228.132. PMC 1128728 . PMID 10634714. ↑ Sachs L, Batra KL, Zimmermann B (2009). "Medical implications of hyperuricemia". Med Health R I. 92 (11): 353–55. PMID 19999892. ↑ Jordan DR, Belliveau MJ, Brownstein S, McEachren T, Kyrollos M (2008). "Medial canthal tophus". Ophthal Plast Reconstr Surg. 24 (5): 403–4. doi:10.1097/IOP.0b013e3181837a31. PMID 18806664. ↑ Sano K, Kohakura Y, Kimura K, Ozeki S (March 2009). "Atypical Triggering at the Wrist due to Intratendinous Infiltration of Tophaceous Gout". Hand (N Y). 4 (1): 78–80. doi:10.1007/s11552-008-9120-4. PMC 2654956 . PMID 18780009. 1 2 Beyl Jr, R. N.; Hughes, L; Morgan, S (2016). "Update on Importance of Diet in Gout". The American Journal of Medicine. 129 (11): 1153–1158. doi:10.1016/j.amjmed.2016.06.040. PMID 27452679. ↑ Bitik, B; Öztürk, MA (June 2014). "An old disease with new insights: Update on diagnosis and treatment of gout." (PDF). European Journal of Rheumatology. 1 (2): 72–77. PMID 27708879. ↑ Abrams, B (2009). "Sleep Apnea as a Cause of Gout Flares". The Medscape Journal of Medicine. 11 (1): 3. PMC 2654686 . 1 2 Zhang W, Doherty M, Bardin T, et al. (October 2006). "EULAR evidence based recommendations for gout. Part II: Management. Report of a task force of the EULAR Standing Committee for International Clinical Studies Including Therapeutics (ESCISIT)". Ann. Rheum. Dis. 65 (10): 1312–24. doi:10.1136/ard.2006.055269. PMC 1798308 . PMID 16707532. 1 2 Moi, JH; Sriranganathan, MK; Edwards, CJ; Buchbinder, R (4 November 2013). "Lifestyle interventions for acute gout". The Cochrane database of systematic reviews. 11: CD010519. doi:10.1002/14651858.CD010519.pub2. PMID 24186771. ↑ Andrés, M; Sivera, F; Falzon, L; Buchbinder, R; Carmona, L (Oct 7, 2014). "Dietary supplements for chronic gout.". The Cochrane database of systematic reviews. 10: CD010156. doi:10.1002/14651858.CD010156.pub2. PMID 25287939. 1 2 Winzenberg T, Buchbinder R (2009). "Cochrane Musculoskeletal Group review: acute gout. Steroids or NSAIDs? Let this overview from the Cochrane Group help you decide what's best for your patient". J Fam Pract. 58 (7): E1–4. PMID 19607767. ↑ Cronstein, BN; Terkeltaub, R (2006). "The inflammatory process of gout and its treatment.". Arthritis research & therapy. 8 Suppl 1: S3. PMID 16820042. ↑ van Durme, CM; Wechalekar, MD; Landewé, RB (9 June 2015). "Nonsteroidal anti-inflammatory drugs for treatment of acute gout.". JAMA. 313 (22): 2276–7. doi:10.1001/jama.2015.1881. PMID 26057289. ↑ van Durme, CM; Wechalekar, MD; Buchbinder, R; Schlesinger, N; van der Heijde, D; Landewé, RB (16 September 2014). "Non-steroidal anti-inflammatory drugs for acute gout.". The Cochrane database of systematic reviews. 9: CD010120. doi:10.1002/14651858.CD010120.pub2. PMID 25225849. 1 2 "Information for Healthcare Professionals: New Safety Information for Colchicine (marketed as Colcrys)". U.S. Food and Drug Administration. ↑ van Echteld, I; Wechalekar, MD; Schlesinger, N; Buchbinder, R; Aletaha, D (Aug 15, 2014). "Colchicine for acute gout.". The Cochrane database of systematic reviews. 8: CD006190. doi:10.1002/14651858.CD006190.pub2. PMID 25123076. ↑ van Durme, CM; Wechalekar, MD; Buchbinder, R; Schlesinger, N; van der Heijde, D; Landewé, RB (Sep 16, 2014). "Non-steroidal anti-inflammatory drugs for acute gout.". The Cochrane database of systematic reviews. 9: CD010120. doi:10.1002/14651858.CD010120.pub2. PMID 25225849. 1 2 3 "FDA approves new drug for gout". FDA. September 14, 2010. ↑ Sundy JS, Baraf HS, Yood RA, Edwards NL, Gutierrez-Urena SR, Treadwell EL, Vázquez-Mellado J, White WB, Lipsky PE, Horowitz Z, Huang W, Maroli AN, Waltrip RW, Hamburger SA, Becker MA (Aug 17, 2011). "Efficacy and tolerability of pegloticase for the treatment of chronic gout in patients refractory to conventional treatment: two randomized controlled trials". JAMA: The Journal of the American Medical Association. 306 (7): 711–20. doi:10.1001/jama.2011.1169. PMID 21846852. ↑ Sriranganathan, MK; Vinik, O; Bombardier, C; Edwards, CJ (Oct 20, 2014). "Interventions for tophi in gout.". The Cochrane database of systematic reviews. 10: CD010069. doi:10.1002/14651858.CD010069.pub2. PMID 25330136. ↑ Ruoff, G; Edwards, NL (September 2016). "Overview of Serum Uric Acid Treatment Targets in Gout: Why Less Than 6 mg/dL?". Postgraduate medicine. 128 (7): 706–15. PMID 27558643. ↑ Ali, S; Lally, EV (November 2009). "Treatment failure gout". Medicine and health, Rhode Island. 92 (11): 369–71. PMID 19999896. 1 2 3 Elizabeth D Agabegi; Agabegi, Steven S. (2008). Step-Up to Medicine (Step-Up Series). Hagerstwon, MD: Lippincott Williams & Wilkins. p. 251. ISBN 0-7817-7153-6. ↑ "Febuxostat for the management of hyperuricaemia in people with gout (TA164) Chapter 4. Consideration of the evidence". Guidance.nice.org.uk. Archived from the original on October 6, 2010. Retrieved 2011-08-20. 1 2 Kim SY, De Vera MA, Choi HK (2008). "Gout and mortality". Clin. Exp. Rheumatol. 26 (5 Suppl 51): S115–9. PMID 19026153. ↑ Roberts-Thomson RA, Roberts-Thomson PJ (May 1999). "Rheumatic disease and the Australian aborigine". Ann. Rheum. Dis. 58 (5): 266–70. doi:10.1136/ard.58.5.266. PMC 1752880 . PMID 10225809. ↑ Fam AG (May 2000). "What is new about crystals other than monosodium urate?". Curr Opin Rheumatol. 12 (3): 228–34. doi:10.1097/00002281-200005000-00013. PMID 10803754. 1 2 3 4 Pillinger, MH; Rosenthal P; Abeles AM (2007). "Hyperuricemia and gout: new insights into pathogenesis and treatment". Bulletin of the NYU Hospital for Joint Diseases. 65 (3): 215–221. PMID 17922673. ↑ "gout, n.1.". Oxford English Dictionary, Second edition, 1989. Retrieved 18 September 2011. ↑ "The Internet Classics Archive Aphorisms by Hippocrates". MIT. Retrieved July 27, 2010. ↑ A. Cornelius Celsus. "On Medicine". University of Chicago. Book IV. ↑ "Gout – The Affliction of Kings". h2g2. BBC. December 23, 2012. ↑ Storey GD (October 2001). "Alfred Baring Garrod (1819–1907)". Rheumatology (Oxford, England). 40 (10): 1189–90. doi:10.1093/rheumatology/40.10.1189. PMID 11600751. 1 2 Agudelo CA, Wise CM (2001). "Gout: diagnosis, pathogenesis, and clinical manifestations". Curr Opin Rheumatol. 13 (3): 234–9. doi:10.1097/00002281-200105000-00015. PMID 11333355. ↑ Choi, HK; Mount, DB; Reginato, AM; American College of, Physicians; American Physiological, Society (4 October 2005). "Pathogenesis of gout.". Annals of Internal Medicine. 143 (7): 499–516. doi:10.7326/0003-4819-143-7-200510040-00009. PMID 16204163. ↑ Rothschild, BM; Tanke D; Carpenter K (1997). "Tyrannosaurs suffered from gout". Nature. 387 (6631): 357. doi:10.1038/387357a0. PMID 9163417. ↑ Abeles, A. M.; Pillinger, M. H. (March 8, 2010). "New therapeutic options for gout here and on the horizon". Journal of Musculoskeletal Medicine. ↑ Sivera, F; Wechalekar, MD; Andrés, M; Buchbinder, R; Carmona, L (Sep 1, 2014). "Interleukin-1 inhibitors for acute gout.". The Cochrane database of systematic reviews. 9: CD009993. doi:10.1002/14651858.CD009993.pub2. PMID 25177840. Chisholm, Hugh, ed. (1911). "Gout". Encyclopædia Britannica. 12 (11th ed.). Cambridge University Press. pp. 289–291.